Nevertheless, I didn’t let my fantasy get the best of me. I moved my stop to breakeven after seeing the pair retreat from 1.4200. Lo and behold, EUR/USD was only able to go as high as 1.4222 before slipping below 1.4100 again. I must admit that the comment of one of my readers also got to me. 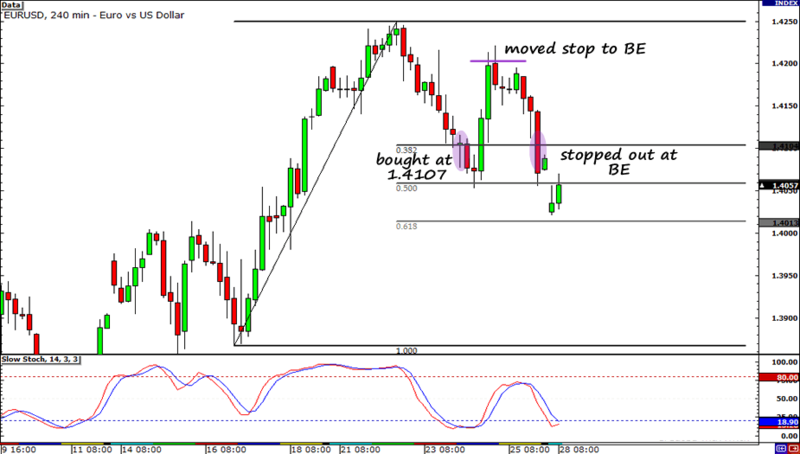 He (or she) told me that he would NEVER let a trade that’s +140 pips positive turned into a losing trade! It seems like Europe’s sovereign crisis has finally caught up on the euro. S&P downgraded Portugal’s credit rating and fueled talks of an impending bailout for the debt-ridden country. The lack of any concrete agreements at the EU Summit might have also made matters worse for the shared currency. Yeah, I’m not the happiest trader in the FX hood. Heck! I was soooo ready to call myself the new Pipstradamus! On the bright side though, at least I was able to keep m account from sustaining another burn. I checked my charts during my break at work today (Sorry boss, I just HAD to sneak in some chart time… Not that you’d see this) and I was immediately swept off my feet by what I saw on the 4-hour chart of EUR/USD. 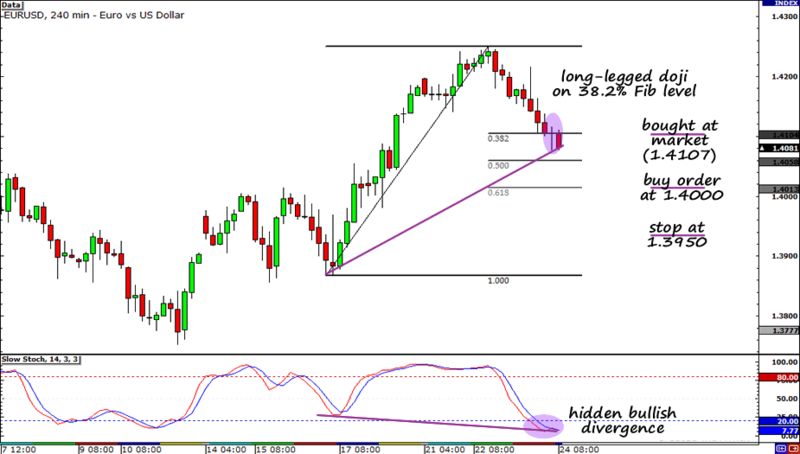 A long-legged doji formed on the 38.2% Fib level and on top of that, Stochastic indicates that the pair is already oversold and is sporting a hidden bullish divergence. 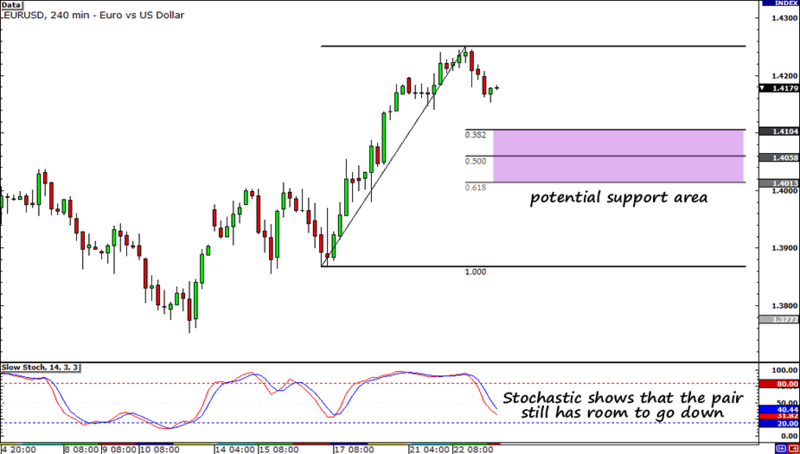 The Stochastic made lower lows while price formed higher lows! According to the School of Pipsology, this kind of divergence works very well with retracements, so I pulled the trigger. However, there’s a little voice inside my head which tells me that EUR/USD may retrace further so I only risked half of my position. I saved the other half for another buy order around the 1.4000 region, near the 61.8% Fibonacci retracement level. I placed my stop well below the 61.8% FIb at 1.3950 and I’m looking to take profit at 1.4250. According to news reports and as one of my readers pointed out, the euro dropped because Portugal’s Socialist Prime Minister Socrates resigned after he couldn’t get the parliament’s backing in his austerity plans. I don’t think bearishness towards the euro would last long though, especially since the ECB is widely expected to raise interest rates in April. Entered at market (1.4107), buy again at 1.4000, PT at 1.4250, stop loss at 1.3950 and risking 0.5% of my account in EACH position for a total risk of 1%. Let’s start with the technicals. As you can see, the pair has been on an uptrend recently, rising from its low this month at the 1.3800 region before topping out a couple of pips above 1.4200 yesterday. With the falling trend line on the longer time frame already broken (you can check out my previous post if you have completely no idea what I’m talking about), I think we could see the pair climb even higher after a quick retracement. But where should I enter? Well, since the Stochastic is showing that the pair isn’t oversold yet, I believe there’s room for the pair to fall. I’m hoping to jump in the uptrend somewhere between the 38.2% and 61.8% Fibonacci retracement levels. Like my other entries, I’m going to enter ONLY IF THE CANDLESTICKS SAY SO! (I’ve already bookmarked the candlestick cheat sheet to make sure I don’t miss any patterns. You should too!) I won’t even dare think about pulling the trigger without any confirmation especially now that sovereign debt woes are slowly creeping back into the spotlight. Word on the street is that Portuguese Prime Minister Socrates threw a fit and warned that he’ll resign if the Parliament rejects the proposed austerity measures. Consequently, this has gotten a few naysayers thinking that this political debacle could send the debt-ridden country asking for a bailout from the EU and IMF. Uh-oh…. However, this is only one side of the coin. What if the Parliament gives the go signal to the spending cuts? Mr. Socrates won’t have to leave and everyone will be happy! More importantly, talks about a Portuguese bailout would die down! Yipee! Maybe then the market’s focus would go back to the possibility of the ECB hiking interest rates in order to tame inflation. Okay, I know all the free coffee I get from work makes me a tad too excited at times, but I don’t think that it’s just the caffeine talking. Earlier today, Slovakian central bank governor and ECB member Jozef Makuch said that there’s a good chance that the ECB will holler a rate hike next month! Now I guess the best thing to do is just wait… and maybe get some shuteye. I may end up looking ten years older for my date this weekend. Eeek! Anyway, that’s all for now. Follow me on Twitter so I can let you know when I have a valid trade. Skadoosh!